The PRIMA Zoom 70F is equipped with an auto-focus system AiAF (Artificial Intelligence Auto Focus), able to detect the subject nearest in the field, even if this one is eccentric. This banal system on the numerical ones of today was not it on the compact ones of 1995. According to a recipe well-running on the cameras of the moment, protective cover slides while letting appear the lens, and causes the setting of the camera and the automatic flash. The loading, the advance and the rewinding of film are automatic, a green LED located close to the viewfinder flickers then becomes fixed when the flash is operational. The flash is equipped with a slow synchronization. 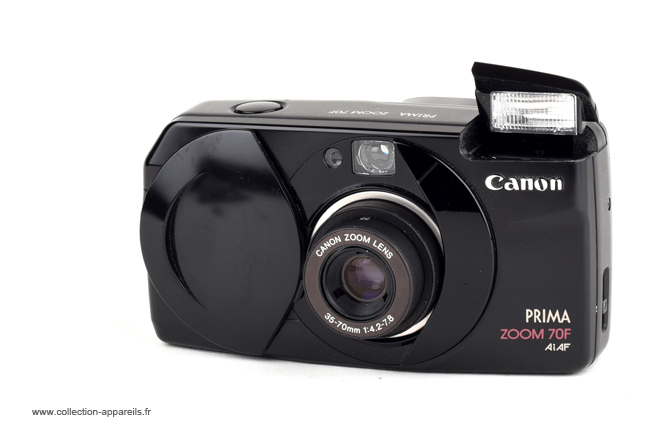 In 1997, Camara sold this camera 890 francs (as an indication, Mju II was worth 990 francs). Its name in the United States was Sure Shot 70 Zoom and in Japan, Autoboy Luna 35.